"Norman...Yes, you are right about the being hooked part-it's such an enjoyable pursuit. The Monteverde arrived today-I cleaned it and inked it up, and too it for a spin. 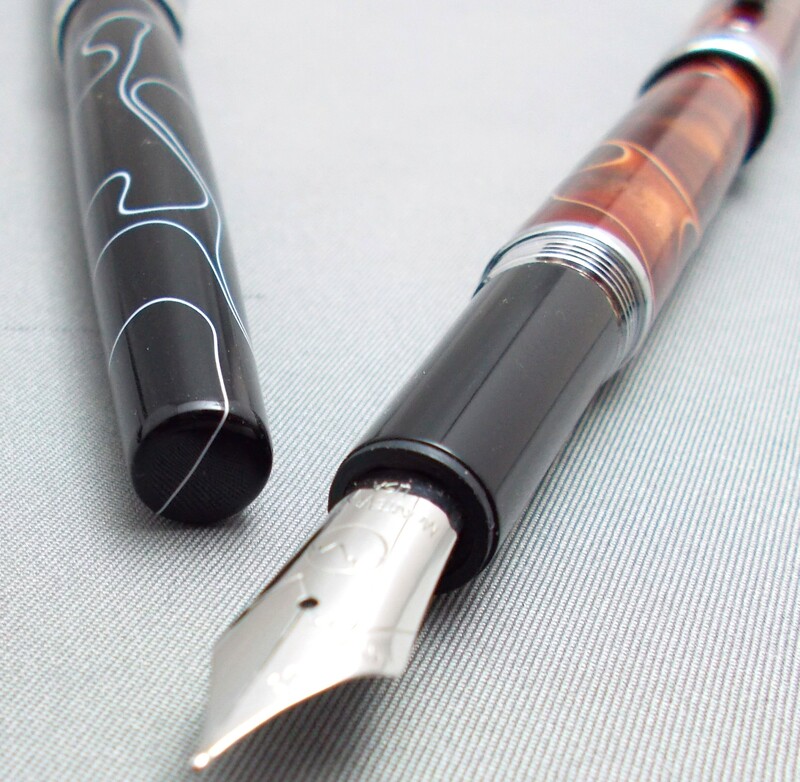 Their stub nib is amazingly smooth, and the flow with the PR fast dry black is really spot on. Thanks again for your level of service, a vanishing thing in this day and age!" 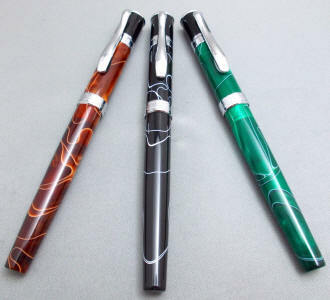 "Many thanks, just received the pen. 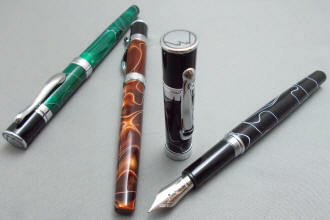 The Monteverde is a stylish pen with good character. 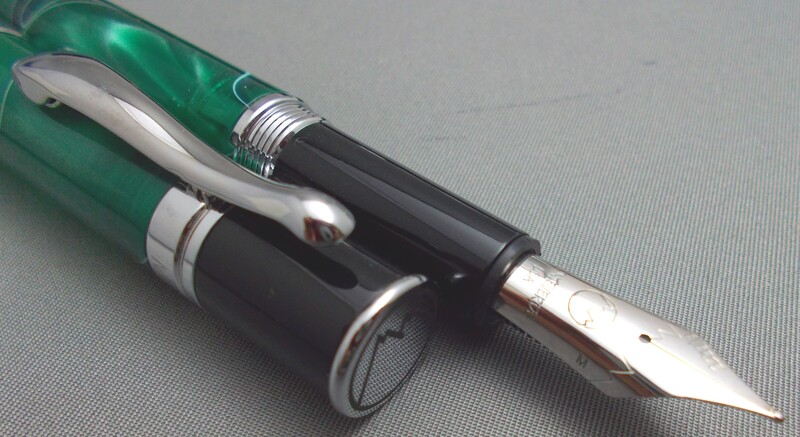 The stub nib is a joy to write with and for someone used to vintage pens will make a very nice everyday pocket pen. Thanks for what I consider Good Old Fashioned Service." 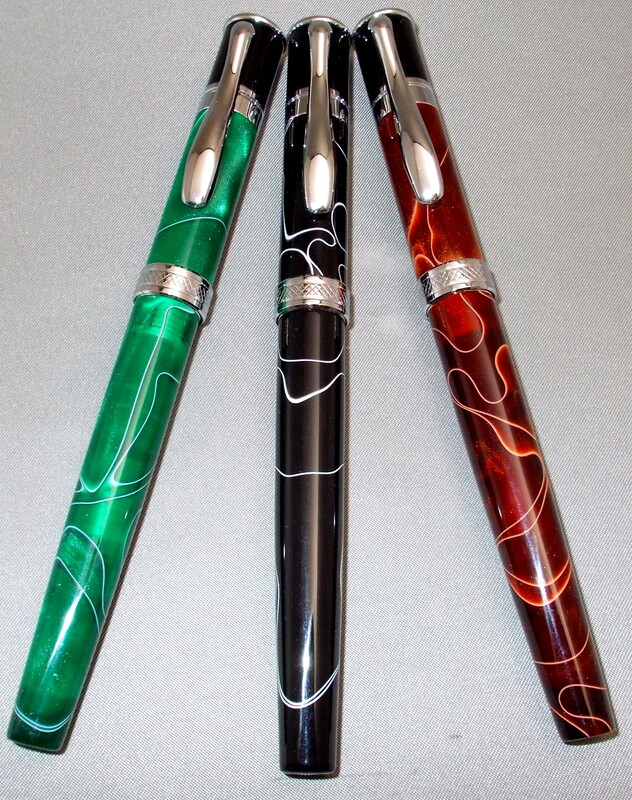 Although the Jewelria line from Monteverde has been in existence for many years, it has been re-imagined with new color finishes...and is no longer just a ballpoint! 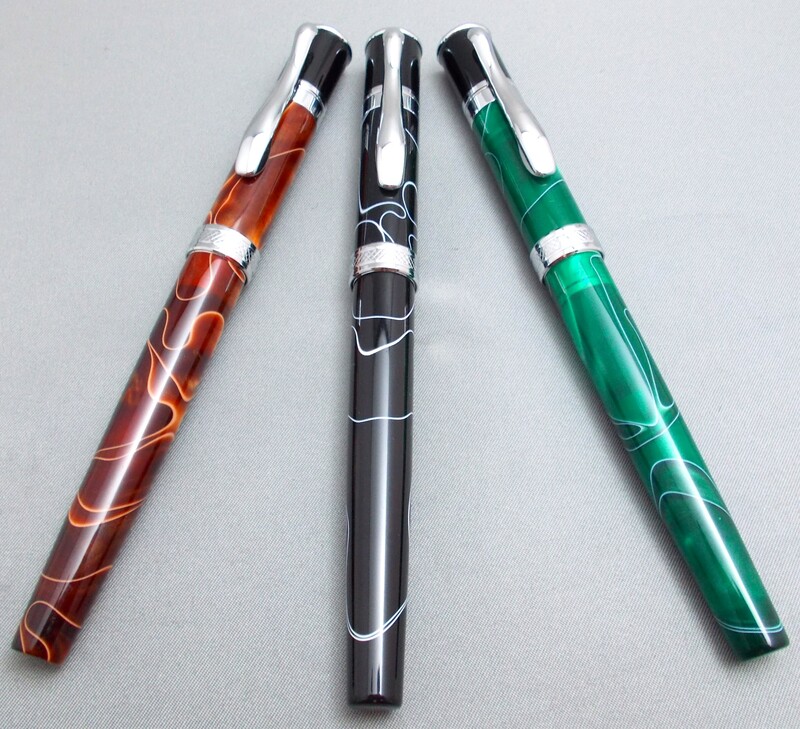 The new fountain pen version of the Jewelria is a fairly slim pen, measuring 5-1/4" capped, 6-1/4" posted and 5" with cap held aside. The rocker clip makes for exceptionally easy pocket or purse placement, as depressing the top of the clip opens up the 'business end'. 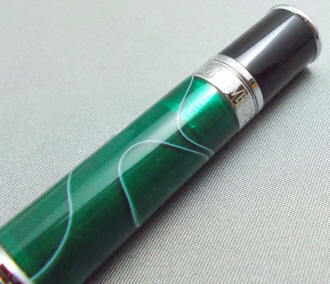 The clip band is engraved with Monteverde USA, and the cap top has the Monteverde mountain logo. The cap band is attractively rendered with crosshatching, providing a jewel-like appearance under direct light. 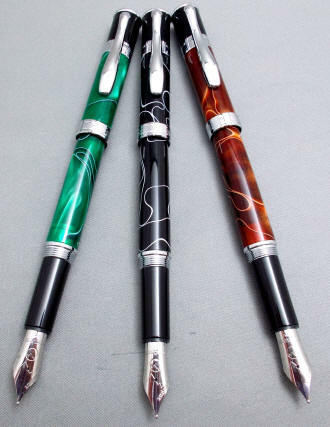 The resin pattern of each pen is unique, and as something of a rarity, the patterning is carried all the way to the end of the barrel. 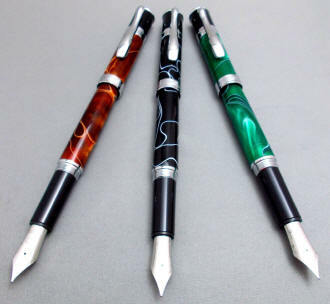 The pen employs a screw-cap, which friction fits on the barrel end should you choose to post it. The nibs are available in B, M, F or the new stub sizes. 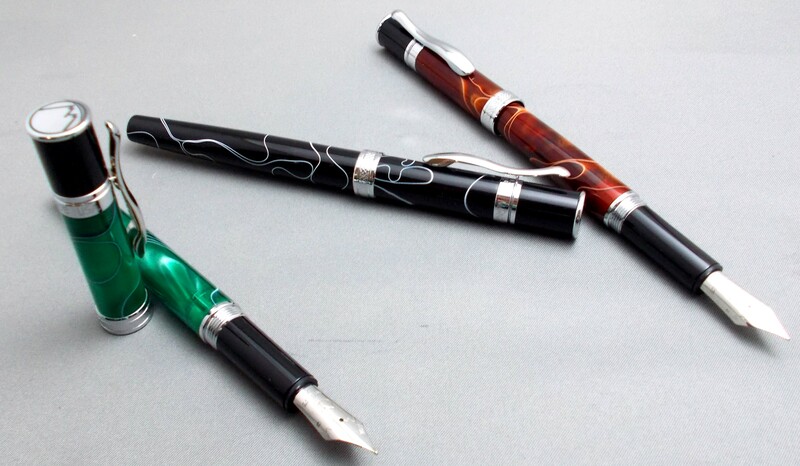 I've found that the Monteverde nibs run about a size smaller than typical western nibs. Hence, I'd classify the B nib as a typical medium, the M as a fine and the F as an x-fine. The stub is a 1.1 mm medium. Please specify the nib size you'd like, by letter or 'stub' only, to avoid confusion when ordering. Additionally, if you'd prefer the look of the equivalent Monteverde black nib, just let me know and I'll make the switch for you. Unscrewing the all-metal threads between section and barrel reveals the large, screw-in piston converter for bottled ink...but as with all new pens, I recommend to run a dilute solution of dishwashing soap (two or three drops to a small bowl of water) through a new pen a few times, followed by water only. 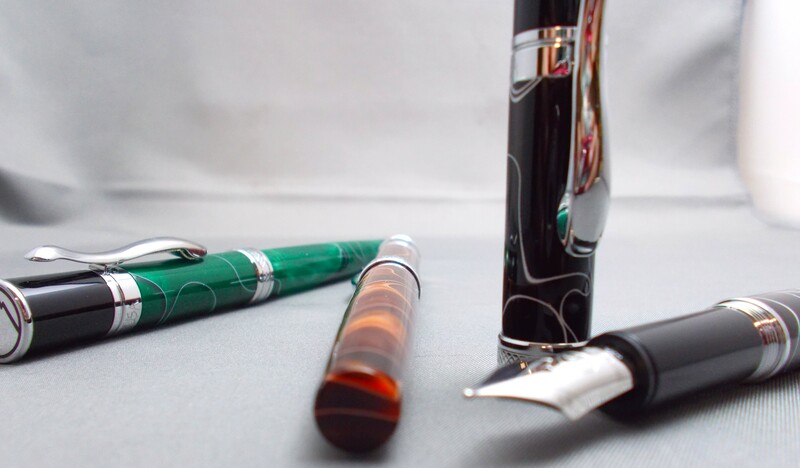 Step one is effective at removing manufacturing oils that can tend to make the ink less than enthusiastic in heading from the converter to the nib, and step two removes the traces of the detergent you've used...which tends to have the opposite, diuretic effect. The pen will also take International-style cartridges, such as those from Private Reserve. The Monteverde gift box and warranty are included.